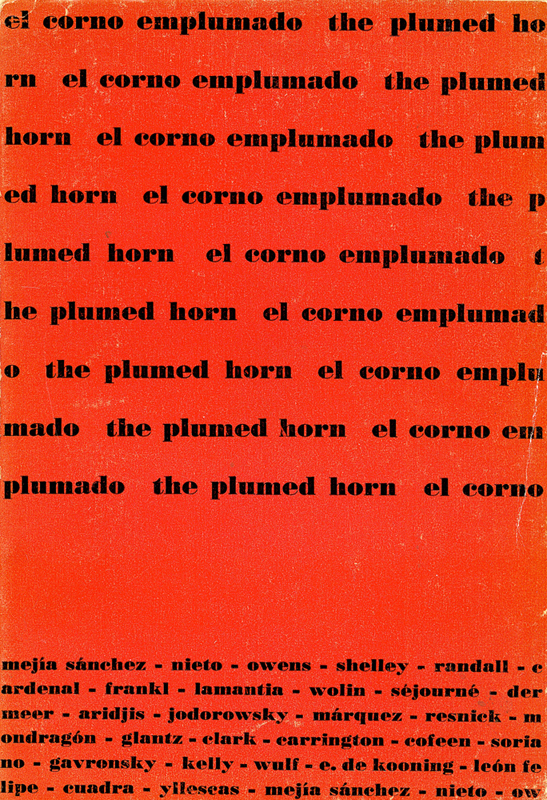 El Corno Emplumado 1 was the first issue of a new bilingual quarterly out of Mexico City. Sergio Mondragon, Harvey Wolin (who left the project shortly after this issue), and Margaret walked Mexico City’s Streets looking for poetry and patronage. Support came from Jose Goroztiza, Mexico’s Secretary of State and himself a fine poet, Arnaldo Orfila, and Jesus Silva Herzog—as well as Kurt Stavenhagen, Sol Arguedas, Jacobo Glantz, James Merill, Bellas Artes, the British Book Store and Gerbers of Mexico. Poems began to come as well. Among the issue’s contributors were Nicaragua’s Ernesto Cardenal and Ernesto Mejia Sanchez, Mexico’s Jaime Augusto Shelly, Laurette Sejourne, and Homero Aridjis, Philip Lamantia, Rochelle Owens and Milton Resnick from the United States, Spain’s Leon Felipe, and Raquel Jodorowsky of Peru. There were drawings by Leonora Carrington, Elaine de Kooning, Juan Soriano,and Carlos Coffeen Serpas. El Corno made an immediate impact among young—and not so young—writers and artists around the world. Soon we were receiving letters and submissions, and even a few subscriptions, from a dozen countries in Latin and North America and even as far afield as India! We began looking for a young poet willing to represent us in each of these places. This usually meant talking about the journal and taking it around to bookstores, suggesting how much an issue should sell for so that young poets in his or her country would be able to buy one, and sending us selections of poems.